Two or three years ago if you told me that Benchmade was your favorite knife company I’d roll my eyes and mutter something like, “Okay Griptillian dude…” now, that’s no disrespect to the Grip, those are great knives at a great price point, but they’re kinda vanilla for my tastes. That was Benchmade a few years ago. I’m not sure what happened over at Benchmade HQ but man are they putting out some absolute HEATERS in the last year or so. Starting with the Benchmade Proper slip joint (reviewed here) to the Benchmade Bugout Ultralight and the full titanium integral Anthem 781. Now, the slip joint thing is kinda interesting. Over the 2-3 year period, slip joints have begun to increase in popularity with the “tactical knife” folks. With the growth in popularity, it only makes sense that companies like Benchmade and Spyderco with the Roadie would begin to investigate the slip joint market. Slipjoints are a very traditional style of knife designed so that a steel spring runs down the spine of the knife, the tension of that spring on the tang of the blade holds the knife open or closed. This design has been around for hundreds and hundreds of years so they’re really nothing new but I do believe that they are seeing a more widespread adoption in the last few years. Like most traditional folders, the Proper is an EDC knife through and through. The Proper is available in two different blade shapes a sheep’s foot/wharncliffe type deal, and a clip point. At the risk of over simplifying the matter, I think that the clip point probably looks the best whereas the sheep’s foot is the most functional. I haven’t handled the clip personally, so take that with a grain of salt. The sheep’s foot is exceptionally useful though, and is ideal for draw cuts when breaking down boxes, or slicing food. The blade stock is .09 thick steel and tapers to a nice .026 behind the edge. If you want to make it REAL crazy you can see if you can get a reground Krein version that is a literal lightsaber. So how about the steel? S30V is a tried and true workhorse. Developed by Crucible with the help of legendary knife maker Chris Reeve, intended to hold a fine sharp edge for a long time, as well as having a very healthy amount of chromium making it extremely rust resistant. In my experience, I find S30V to be a little chippy (in fact my Proper has a little chip out of the edge). Sharpening it is easy enough, and the edge does last a long time, to some extent S30V has become a little ho-hum in the realm of super steels. It’s still a performer though, and I do recommend it. The Proper, at the time of this review, is available in two handle materials. The first being red G10, and the second being the (more popular) green micarta. In terms of material I think they are equal, both G10 and micarta will stand up to a lot of wear and tear. They both offer a decent amount of grip traction for your hand in normal EDC use (what you’d use a slip joint for, no skinning wild boars or Hollywood-style knife fights). The shape of the handle provides a great grip as well, with two very slight depending angles or you might call them quasi-choils on either end of the handle lock my pointer, middle, and ring fingers in place. The knife also has a bit of a badonkadonk, with a larger handle that extends past the downward angle of the choil, giving you an even more secure grip on the knife itself. That some extension also houses the lanyard hole. I think all-in-all the knife is well designed for its intended use. This is not going to be a knife that you’re going to put through serious/hard work. A folding, non-locking, knife like this you’re going to perform pretty lightweight tasks. So, the knife does not technically lock. It’s held in its various positions by the tension of the backspring. That being said, the Proper has a softer action than I’ve felt on other slip joints. Customs that I have had, or even GEC’s have very positive “walk and talks,” or the feeling and sound of the knife moving into its different positions. I would prefer a positive action on the knife throughout, but when opened it doesn’t feel insecure. All things said and done, I think that the Benchmade Proper offers a lot to be had in terms of a modern/non-traditional slip joint. More interesting than that, however, I think seeing knives like this, the Spyderco Roadie, and even the Hinderer XM18 slippy hitting the marketplace shows an interesting trend when it comes to how people are choosing to spend their money. If you had told me two years ago that I’d see a Hinderer slip joint or that Benchmade was making their own version of a non-locking folder I would have thought you were nuts, but here we are. I think the value is there, you’re going to spend nearly the same for a new Great Eastern Cutlery slippy, but you’re getting a modern design with a modern blade steel, versus GEC’s tried and true 1095. If you’re not a slip joint guy, I think the Benchmade Proper is a great place to start. And if you’re already “in the fold,” then maybe it’s a good way to diversify your collection. 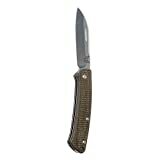 Editor: I recommend purchasing the Benchmade Proper at Amazon or BladeHQ. Please consider that buying anything through any of the links on this website helps support BladeReviews.com, and keeps the site going. As always, any and all support is greatly appreciated. Thank you very much.